When it’s time to celebrate a birthday, Chelsea Piers has you covered. All parties are action-packed, entertaining and hassle-free, with more sports, more activities and more fun than any other party venue in NYC. Two-hour birthday party packages are available Fridays, Saturdays and Sundays, with limited availability Monday - Thursday. For children's birthday parties, packages include enthusiastic staff and world-class facilities plus balloons, paper goods and candles. Packages are also available that include pizza, beverages, cake, favors and catering services. Adult Birthday parties, Bar/Bat Mitzvahs and Sweet Sixteens are also available. Even the youngest of the birthday children can celebrate with party options for one to four-year-olds. Parties feature non-stop action, supervised activities and multiple sports to choose from. Chelsea Piers is one of the area’s most popular destinations for tween & teen parties. Why should kids have all the fun? Celebrate your next birthday with an enjoyable day of sports and games. Chelsea Piers offers several spectacular locations for Bar & Bat Mitzvah celebrations. 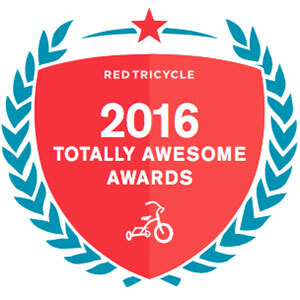 We're proud to be Red Tri's pick for the Best Birthday Spot in New York City in their 2016 Totally Awesome Awards!